The smith machine is a weight training tool that can be used for various exercises such as squats, presses, rows and shrugs. 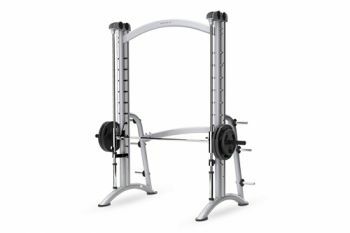 This machine has six integrated weight-storage horns that hold multiple weight-plate sizes and a counter balanced 11.3 kg bar take-off for low starting resistance. It features a 90-degree path of motion that easily adapts to all exercises and linear bearings that provide a smooth motion.